With the #Chowkidar campaign, has Modi turned the tables? Corruption is in the forefront once again as the elections are coming closer. 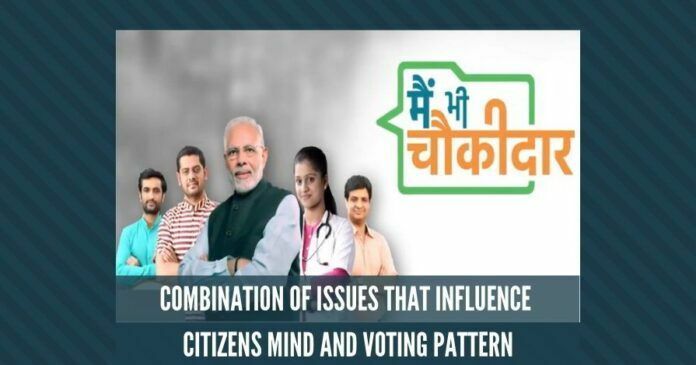 The #Chowkidar campaign launched by PM Modi is gathering steam. The issue of corruption which was sidelined in-between during the last 5 years is back in limelight to checkmate Congress opposition and is seen as an election-winning plank. The accused are using all possible means to delay the process. Not a single VVIP in the past 5 yrs have been put behind bars on charges of corruption. The 2014 election was won on a tripod combination of Fight against corruption, Hindutva, and Vikas – Development + Governance as its core agenda. The major contributor for BJP-led NDA victory then was the corruption of Congress-led UPA regime and the alleged scams during their tenure. Dr Swamy single-handedly played a crucial role in exposing the corruption of the previous Govt., it’s ministers and the Gandhi family. Shri Narendra Modi proved himself as a decisive leader and took the party to electoral victory. There is an old track record of many previous governments that even after a very good performance, the govt was voted out of power. Elections are fought and won on a combination of multiple factors and in India corruption issue always determines the majority of the votes. The Modi Govt. was slow on the fight against corruption. In the last 5 years, many cases got diluted, leading to acquittal of eg the famous 2G scam. The slow pace in which the investigation progressed in other high profile cases is a classic example of how corruption cases were internally sabotaged. Judiciary too is dragging on at a very slow pace as per our prevailing system. The accused are using all possible means to delay the process. Not a single VVIP in the past 5 yrs have been put behind bars on charges of corruption. The indecisiveness to fight corruption in the last 5 years has presented Modi govt in poor light. Strong will and determination are missing in tackling many of the high profile corruption cases. There are numerous instances where Dr. Swamy had to write letters and reminders to PM Modi for a course correction. In a few cases, the responses were positive and once again the matters were on track. Much more is desired to be done on the fight against corruption. The sudden call by PM Modi in the midst of the election campaign raking the corruption issue through #Chowkidar has once again brought the fight against corruption to the forefront of election plank. Dr. Swamy has always been a crusader against corruption and it behooves PM Modi to enlist his services in the upcoming elections so he can get re-elected with a comfortable majority. Stability and drive against corruption is the need of the hour. Previous articleManohar Parrikar leaves behind a legacy of a clean image in today’s Politics. OMJI. Corruption was there before, is there now and will be there later. But if you look at the scale of it in BJP and Congi ruled states with out bias one thing is crystal clear, that is one is a minuscule and the other is gigantic mountainous proportions deep rooted. PM and many are not sitting quiet in terms of eradication only due to legal hurdles and lethargy and also Media subjugation , protection of the corrupts in every stage. No body is questioning them. why ?? This should be the big issue.